Bible engagement is Trinity engagement, nothing more and nothing less. All Bible engagement is connecting with the triune God – Father, Son and Holy Spirit. So Bible engagement is Father engagement, Jesus engagement, and Holy Spirit engagement, because all three are one and one is all three. That’s not to say that the Father is the Son or the Holy Spirit, or the Son is the Father or the Holy Spirit, or the Holy Spirit is the Son or the Father because they are three coexistent, co-eternal persons who are God. 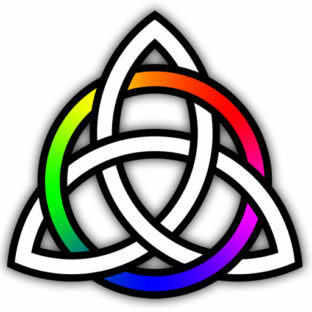 The individual members of the Trinity have different roles in Bible engagement. The Father initiates all things and is the ultimate source of the Word (John 1:1, Revelation 1:1). The Son is the agent through whom the Father reveals the Word (Matthew 11:27, Luke 24:45, John 1:3, 14). And the Holy Spirit is the agent through whom the Father teaches the Word (John 14:26, John 16:13-15, Ephesians 3:5, 2 Peter 1:21). So when we engage with the Bible we are connecting with a loving heavenly Father, through the Son who reveals Him, by the Spirit who guides and teaches us about Him. Knowing that Bible engagement is Trinity engagement is immensely practical. When we engage with the Bible we are not alone. The Father is watching over us, the Son is opening the Word to us, and the Spirit is helping us know and grow in the Word. With this in mind we can confidently, imaginatively and personally meet with God in and through His Word. Bible engagement is never a solo affair. It’s highly relational and dynamic. The Father, Son and Holy Spirit work together to help us enter into the Word as parts of the big Story and then help us enact out the Word in our own lives. Simply stated, we are not alone when we engage with the Bible. The triune God is with us, opening our eyes to see and our ears to hear in ways in which we can grow in understanding, insight and faithful action. Categories: Relationship | Tags: Bible engagement, Bible engagement and the Trinity | Permalink. Bathe everything in prayer. Pray before, after and during the time spent together. When you begin, pray something like, “God we’re going to be reading your Word. Help us to engage it actively, but also to listen attentively. You are the Teacher and we’re your students. Please convict, guide and transform us. Amen.” For the duration of the gathering be prepared to stop the dialogue to pray the Scriptures into personal needs or situations. When you close, pray something like, “Thank you Lord for the way we’ve met you in and through your Word. Help us apply your Word in everything we say and do. For your honour and glory. Amen. Get to know each other. Create time and space for building relationships. Strong relationships are needed for heartfelt/meaningful dialogue. Foster an environment that’s friendly, respectful, and builds trust. Look for practical ways to love, encourage, and celebrate life together. Read the Bible in multi-sensory ways. Be creative and three-dimensional, i.e., move beyond the printed page. For example, when reading about the Lord’s Supper/Eucharist/Communion in 1 Corinthians 11, have a fresh loaf baking in a bread maker so that the smell pervades the air. When you finish reading the passage, eat the bread while discussing the text. Teach public reading of Scripture. When we read the Bible together we should aim to read it well. Some basic instruction will help people read more confidently and meaningfully. For more information check out the Bible Engagement Blog post, Reading the Bible Publicly. Don’t reduce the Bible to a sourcebook for finding the right answers. The purpose of a small group Bible study should never be ‘knowledge about the Bible’. Bible knowledge isn’t an end in itself, nor is it a means to an end. The aim isn’t right answers, it’s knowing the One who is the answer. Interact with God’s Story in ways that our stories (as individuals and as a group) are formed and transformed by His Story. Make the main thing the main thing. Spend more time reading the Bible than reading books, commentaries, curriculum, or study guides about the Bible. It’s not a Bible study if the main thing is reading someone’s book about the Bible, listening to someone preach/teach on a topic from the Bible, or watching a video series about the Bible! God’s Word, read/heard, should be the primary text/content, and the Holy Spirit should be the ultimate teacher. Discuss the uncomfortable/difficult passages. Be prepared to struggle with the ‘hard’ Scriptures, even when you don’t find satisfactory explanations. Wrestle with different points of view in a respectful and mature way. Aim to read/hear the Scripture through the voices/ears of the whole group. Recognise how your own view of Scripture is limited, and that the fullness of Bible reading comes into its own when God speaks through different people. Listen beyond your traditional theological grid. Allow God’s Word to challenge your presuppositions. Be humble. Be aware of the limitations of your insight and understanding. Be open to how God works mysteriously and powerfully, in and through His Word, to redeem and restore your life, and the lives of everyone in the group. The “Book Club” approach. Ask group members to read a whole book of the Bible prior to getting together, or read a big chunk when you are together (an entire story). Then open it up for dialogue. Discuss the writers intent, themes, plot, characters, what people liked or didn’t like, and so on. The “Visual Arts” approach. Read a portion of Scripture, then view art forms (from different cultures and centuries) such as ceramics, drawings, paintings, sculptures, stained glass, wood carvings, and such, that illustrate the text. Discuss the artists context, how s/he interprets the biblical narrative/event, and how it may or may not be true to the text. What would you add? Share your tips for strengthening Bible engagement in small groups. Categories: Interaction, Relationship | Tags: Bible reading, Small Group Bible study, small groups | Permalink. The way we learn varies from person to person. There are 7 styles of learning: visual (spatial, using pictures and colour), aural (auditory, musical), verbal (linguistic, word-based techniques), physical (kinesthetic, using sensations or role playing), logical (mathematical, using reasoning), social (interpersonal, in groups), and solitary (intrapersonal, working alone, self study). Most of us incorporate a mix of these learning styles and rarely fit in only one category. My predominate learning style is intrapersonal, but I sometimes need an interpersonal learning strategy to help me reflect on and critique my understanding. I’m also very dependent on logical systematic thinking and word based techniques. The Paul and Timothy principle. Learning is strengthened when it’s under the guidance of a Christian mentor (cf. Philippians 4:9). Some biblical examples include Jethro guiding Moses (cf. Exodus 18), Priscilla and Aquila explained the way of God more adequately to Apollos (cf. Acts 18:26), Paul teaching Timothy sound doctrine and practical faith (cf. 2 Timothy 1:13, 2:2, 3;10, 14), older women training younger women (cf. Titus 2:4), and the ultimate example of Jesus investing 3 years into the spiritual development of the disciples. The yacking principle. Some people love to chat. Bible teaching is strengthened when people are given occasions to verbalize their thoughts and discuss what they’re learning. The theme park principle. Memorable learning experiences help to etch God’s Word on our hearts and minds. Working in a soup kitchen is a more powerful learning experience than reading about the poor. According to Edgar Dale the least to most effective teaching methods are: verbal activities, visual symbols, simulated experiences and direct experiences. The Sherlock Holmes principle. Some people are more motivated to learn when the answers aren’t obvious. Simplistic yes/no questions should be avoided. Jesus, the master teacher, used parables with hidden meanings. When we teach the Scriptures we should interact with the mystery and suspense that’s ingrained in the Story. The sticky principle. The only Bible learning that really sticks is that which is Spirit informed (cf. John 14:26). Human teaching must be subject to and guided by the Teacher (the Holy Spirit) because only He can ultimately inform, transform and conform the learner to His Word. The Sandals Beach Resort principle. An environment that’s comfortable is usually more conducive for learning than one that isn’t. On a purely practical level the Bible is best taught in settings where there are suitable lights, furnishings, an ideal temperature and the distractions are eliminated. The concrete principle. Organized, rationale, logical thinking should be the underlying foundation for all teaching. Learning that requires abstract, hypothetical, or philosophical thinking should be built on concrete foundations. The show and tell principle. My wife, when she was a full-time kindergarten teacher, scheduled a weekly show and tell. It gave each child an opportunity to show and tell the other children about something that was special or important. Show and tell shouldn’t be restricted to children. Facilitating creative space for all age groups enhances the learning experience. The Google principle. The ability to search the internet for facts, answers, opinions and such enables us to take ownership of what we learn and when we learn it. Bible study is strengthened when there’s shared ownership of the process. The travelling supper principle. A variety of settings enriches the learning experience. I’ll never forget studying Acts 17:16-34 while sitting on the Acropolis rocks where the Areopagus would have been situated. And I’ll never forget Psalm 30:5 after singing it over and over again with a congregation of poor believers on the Caribbean island of St. Vincent. The iTranslate principle. We learn new things better when we’re given a chance to put what we’re learning into our own words (e.g. Matthew 16:13-20). Have your say. Share your Bible teaching principles. Categories: Encounter, Interaction, Relationship | Tags: Bible teaching, Bible teaching principles, Teaching the Bible | Permalink. Many people engage with the Bible in order to know more. They study the Bible to learn about faith, God, morality and how to live their lives. Gaining information and growing in knowledge about the Bible is the desired end. An informational approach to the Bible is largely borne out of the fact that we’ve been wired by educational institutions to gather facts, interpret events, and understand our world. But the Bible is not a text book and God never intended for us to treat it as one. That’s because the goal of Bible engagement is something far greater than elevating our knowledge or trying to understand the Word. So what is the goal of Bible engagement? Maybe one of the reasons why we approach the Bible informationally rather than relationally is because we’re inclined to look out for our own wellbeing. We study the Bible because we want help, healing, hope and so much more. And yes, God gives us these things, but only within the context of a reciprocating relationship. The trouble is, we sometimes get the cart before the horse, we major on the benefits of the relationship when we should be majoring on the fact that “every good and perfect gift is from above, coming down from the Father …” James 1:17. That’s not to say that engaging the Bible relationally is easy. It’s not. Bible engagement requires personal discipline and intentionality as well as wisdom and strength from God. In fact when we try to engage the Bible relationally, without the help of the Holy Spirit, we usually fail. Here’s the rub: Knowledge about the Bible is important, but knowledge without an intimate and dynamic relationship with Jesus Christ, is hazardous. This is the point that Jesus was trying to make to the Pharisees (Mark 7:1-13). It’s a matter of first principles. We can’t find truth or know truth if we’re disconnected from the truth-giver. Years ago, when I was a full-time pastor, I remember hearing a story about a dinner gathering that was attended by a well known orator. During the course of the meal he was asked to recite the 23rd Psalm. He eloquently recited the psalm and everyone was impressed. Then someone turned to the old pastor who was also there that night and asked him if he would recite the 23rd Psalm. As he recited the psalm it was obvious that his words came more from his heart than his lips. Instead of the people being impressed, they were moved. Of course we know what made the difference, the orator knew the words but the pastor knew the One who is the Word. Do we know the One who is the Word? Effective healthy transformational Bible engagement fails or succeeds based on how we answer this question. Categories: Relationship | Tags: Bible engagement | Permalink. I’m excited to announce that Bible Engagement Basics will be published in June 2017 by Scripture Union and Principes d’interaction avec la Bible will be published in the Fall by Ligue pour la lecture de la Bible. Bible Engagement Basics was fermenting in my mind for several years, though I didn’t know it. It was only when my colleague Donald Tardif directeur Ligue pour la lecture de la Bible suggested that I write a book on Bible engagement that I realised it was destined to be and prayerfully started the research, planning and writing. My motivation for writing Bible Engagement Basics was to help people connect with the Bible to connect with Jesus. That’s what this book’s about – connecting us with God’s Story in ways that lead to meaningful encounters with Jesus Christ and our lives being progressively transformed in Him. The target audience for Bible Engagement Basics is Christian leaders, pastors, teachers, congregations, and believers who identify that Bible reading alone is not enough. In other words, it’s for people who want to know the “how to” of practically improving and enhancing their engagement with the Bible. I’m very “into” Bible engagement. I believe in its spiritual importance, practice it, teach on it, research it and have read everything I can get my hands on about it. Bible Engagement Basics is the book I’ve been lookin g for over the past 7 years but couldn’t find. Thank you Lawson Murray for providing us with this excellent resource! Bible Engagement Basics gives us a biblical, theological and practical foundation as to why Scripture is the key to our relationship with God, and then takes the all-important next step (often skipped) to give us a broad selection of engagement practices to help us all learn how to actually reflect on the Bible with depth. Just as there are many ways to exercise and get in shape, Lawson shows us a number of ways that we can come to the Bible to meet and know God. The book is full of clear and practical suggestions, encouragement and resources that can help any and all Bible engagers meet God in His Word. One of my favorite sections of the book suggests thoughtful and creative ways people in different age groups can best engage the Bible. I highly recommend this book as the “go to” book about how to engage Scripture to engage God. Phil Collins, Professor of Christian Educational Ministries, Taylor University, Executive Director (Training and Content) Taylor Center for Scripture Engagement. Lawson Murray’s book on Bible engagement is filled with wisdom. It is a rallying call to get God’s words inside of us so that we are lit up with life, so that the Word might become flesh again and again, read and known by everyone we meet (2 Cor. 3:2). But Murray’s book is not just a rallying cry; it is filled with insight as to how to make this happen. A major part of the solution is to realize that Scripture is one amazing Love Story from beginning to end, a Story in which every human being who ever lived is included, and that the Author has entered His own Story to communicate the most radical love possible for each person. Read this book and be changed! Stephen G. Dempster, Professor of Religious Studies, Crandall University. Whether you are finding for the first time the riches found within the Bible, or you are a seasoned teacher of the Bible, Lawson’s book offers guideposts to going deeper. These guideposts are practical, encouraging and grounded in the experience of one who loves God and His living Word. Mark Forshaw, Chair, Forum of Bible Agencies – North America. Lawson Murray’s excellent book “Bible Engagement Basics” offers a very readable overview of how we can connect with God in His Word. In so doing he’s done what John Stott’s “Understanding the Bible” did for a past generation; he’s expressed the heartbeat of the global Scripture Union movement in a fresh new way. Whitney T. Kuniholm, President Emeritus, Scripture Union USA. 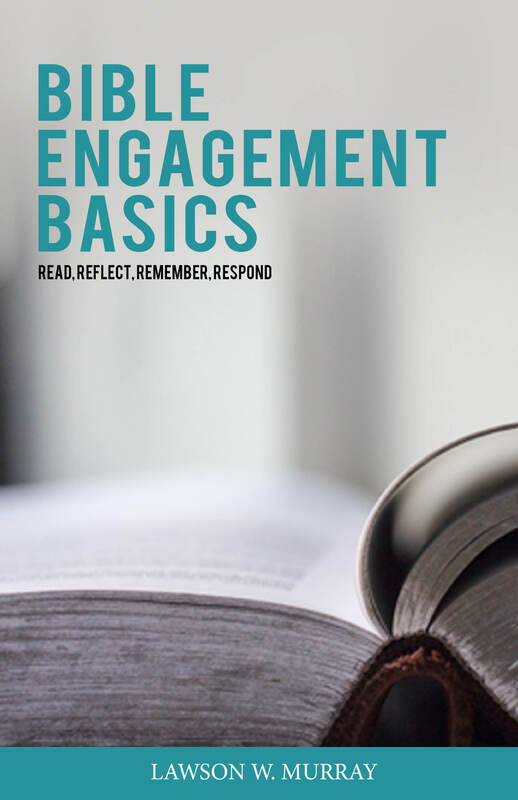 Whatever you know about Bible engagement, you’re sure to discover another approach in Dr. Lawson Murray’s book, Bible Engagement Basics. Dr. Murray explores many approaches to Bible engagement, like the basics of reading, teaching and preaching God’s Word. But he also encourages readers to use their imagination to enhance the experience. The common denominator to all of his approaches? They set us up for meaningful encounters with Jesus Christ so our lives are transformed in Him. Roy L. Peterson, President & CEO, American Bible Society. In our LifeWay Research study, we found that Bible engagement had the highest correlation with every other area of spiritual growth. We’ve all seen it – engaging the Bible is essential to spiritual growth. 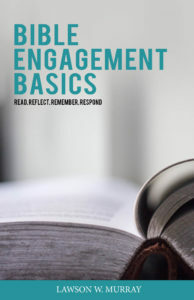 Now, you can be encouraged through Bible Engagement Basics to help you engage well! Ed Stetzer, Billy Graham Distinguished Chair, Wheaton College. We call ourselves “People of the Book,” but many find the slow meditative reading that lets it sink into our hearts hard to do. This book is filled with suggestions to help you find approaches to taking in the Scriptures. Pastors and leaders will find in it a rich and thoughtful biblical theology of Bible engagement. James C. Wilhoit, Professor of Core Studies and Scripture Press Professor of Christian Education, Wheaton College. Categories: Encounter, Interaction, Relationship, Transformation | Tags: Bible Engagement Basics, Bible Engagement Basics Recommendations | Permalink. When you pray, use the prayer book (the Bible). Do you sometimes feel like God doesn’t hear your prayers? Are you praying the same hackneyed supplications over and over again? Do you lack confidence when you pray? Are you sometimes unsure about what to pray or how to pray in certain situations? Are your prayers mainly about your family, your friends, your health, your work, or your wealth? Would you like your prayers to be more effectual? Do you want to pray in line with God’s will? Do you want to release the power of Scripture into your everyday life? If you answered yes to any of these questions then maybe it’s time to broaden the scope of your prayers – to discover how your prayers can be renewed and revived through praying the Scriptures. Praying the Scriptures is using God’s words to form our prayers. It’s praying His Word back to Him. Specifically, praying the Scriptures is using the words, phrases or themes of a Scripture passage to guide, sha pe and give language to our conversations with God. It’s done by praying a Scripture text word for word as one’s own prayer, by personalizing a Scripture text, or by turning our thoughts and feelings about a topic/theme of a Scripture passage into prayer. Scripture – The Lord is my shepherd, I lack nothing. Prayer – Lord, thank you for being Jehovah-Raah, my Shepherd. Because you’re my Shepherd, I don’t need a thing. You intimately take care of everything. Please watch over my life and the lives of my family members today. Scripture- He makes me lie down in green pastures, he leads me beside quiet waters, he refreshes my soul. Prayer – Lord, thank you for giving me opportunities to rest. Sometimes I’m too busy for my own good and too preoccupied to see your beauty around me. Help me be still and know that you are God. Please rejuvenate me today. Scripture – He guides me along the right paths for his name’s sake. Prayer – Thank you Lord for your guidance. You steer me along the path of righteousness. True to your name, you keep me on the straight and narrow road that leads to life. And you do it all for your glory. Scripture – Even though I walk through the darkest valley, l fear no evil, for you are with me; your rod and your staff, they comfort me. Prayer – Lord even in the bleakest circumstances you are by my side. What a relief to know that when I’m down, you are with me. So why am I anxious? There’s no need for me to be afraid because I’m safe and secure in you. Scripture – You prepare a table before me in the presence of my enemies. Prayer – Thank you Lord. I’m never forsaken. You faithfully provide for me, even in difficult times. It’s remarkable. You serve and honour me when I should be serving and honouring you! And more, you do it in front of my enemies. Scripture – You anoint my head with oil; my cup overflows. Prayer – Who am I that you are so mindful of me? I’m blessed from the tip of my head to the soles of my feet! Thank you, your blessings aren’t limited, day in and day out, they keep on coming. Scripture – Surely your goodness and love will follow me all the days of my life, and I will dwell in the house of the Lord forever. Prayer – Your love is amazing! Wherever I am and wherever I go, you keep on chasing after me. You are good and your love endures forever. Today, tomorrow, and throughout my life, your grace and mercy is with me. And when I leave this life you’ll still be there, loving me forever. Thank you, you truly are my Shepherd. Because of your great love, I have everything I really need. Amen. Reading the Scriptures and praying the Scriptures should be a continuous cycle in our daily devotions. Why not do it now? The psalms are a great place to begin, or go to a portion of Scripture you’re presently reading, and pray it back to God. Categories: Interaction, Relationship | Tags: Bible reading and prayer, Prayer, Praying the Scriptures, Scripture reading | Permalink. How can we help Millennials engage with the Bible? It begins with understanding who they are. Millennials, also known as Generation Y or the Net Generation, are the cohort who reached adulthood around the turn of the 21st Century. While there are various proposed dates for Millennials, the earliest suggested birth date is 1976 and the latest 2004. Millennials have grown up in a socially networked world, are tolerant of differences, are confident/positive, rely heavily on technology, and are generally optimistic. They can however be prone to entitlement/narcissism and hold unrealistic expectations that sometimes lead to disillusionment. A large percentage of Millennials are politically and religiously unaffiliated. They have more Facebook friends than any other generation, send a median of 50 texts a day, and post the most selfies. Millennials are also wary of institutional religion, yet more likely than other generations to believe in the existence of a god. They are tolerant regarding sexual orientation, concerned about social justice, and more spiritual than religious. Demonstrate what works. Millennials want to know what works before they’ll accept it as truth. Exhibit Bible engagement methodologies in action and then invite Millennials to participate. Start with their life questions. Millennials are more open to engaging with the Scriptures when the Bible engagement approach begins with the questions they’re asking. Recommended resource – Taste and See: An Invitation to Read the Bible. Offer multiple choices. Millennials are consumers, they expect a range of alternatives. Provide them with a variety of Bible engagement resources, e.g., Lectio Divina, Inductive Bible Study Method, Praying the Bible, Lectio Continua, Bible Journaling, Spoken Word/Slam Poetry, etc. Make needs based connections. Millennials have a burden for social needs and injustice/c ompassion issues in our world. Themed Bibles, e.g. God’s Justice, provide a doorway to Bible reading/reflection. Utilize online resources. Introduce Millennials to YouVersion, Bible Gateway, theStory and other electronic Bible engagement guides, tools, resources. Cultivate small groups that value transparency, vulnerability and authenticity. Create safe places for radical honesty. When Millennial values are not prioritized, it’s difficult to facilitate meaningful dialogue about the Scriptures. Apply the Scriptures together. Millennials think in terms of community service and involvement. Link the Scriptures to practical service projects, i.e., give Millenials opportunities to serve and share what’s on their hearts. Read from printed Bibles. While Millennials are techno-savvy and screen friendly, their preferred format for Bible reading is the book form. Recognize that Christian Millennials have a high view of Scripture. They believe the Bible is the actual/inspired Word of God, is their greatest source for moral truth, and should hold a high or the highest priority in their life of faith. In contrast, non-Christian Millennials hold ambivalent or extremely negative views about the Bible. Make connections with the big screen. The majority of Millennials have seen at least one biblically themed movie in the last year. Post texts on social media. Millennials are more likely than any other generation to post and read scriptures on Twitter, Facebook, and Instagram (more than 80% posted scriptures online in the past year – Barna). Facilitate the freedom to disagree. Millennials only feel safe to reveal and understand their inner selves when questions, doubts and differences are permissible. Leverage relationships. We must live out the faith in order for Millennials to relate, i.e., practice and model what the Bible teaches. Categories: Interaction, Relationship | Tags: Bible engagement with Millennials, millennials | Permalink. Bible engagement is about Jesus engagement. This may seem obvious, but there are a lot of Bible related things that aren’t ultimately about Jesus. In fact whenever Bible related programs, activities, projects, seminars, challenges, courses, or initiatives are exclusively about Bible reading, Bible study, Bible translation, and such, then it may be nothing more than Bible idolatry. Jesus said, “… you shall be witnesses to Me …” Acts 1:8 (NKJV). It’s a matter of priorities; making the main thing, the main thing. It’s not Bible reading and reflection that are important. They’re just the means to a desired end. And what is the desired end of Bible reading/reflection? Is it moralistic – reading the Bible as an example to imitate? Is it intellectual – reading the Bible as something to know? 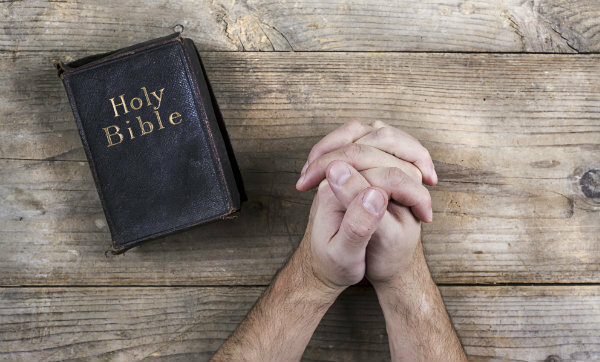 Is it therapeutic – reading the Bible to feel better about ourselves? Is it theological – reading the Bible to systematically develop religious beliefs? Or is it deistic – reading the Bible for truths about God? No, categorically no! The desired end of Bible reading must be to connect with, be transformed by, and live in obedience to the One of whom it speaks – Jesus Christ. “To this you were called … that you should follow in his steps” 1 Peter 2:21 (NIV). By emphasising Bible reading just for the sake of Bible reading, we perpetuate something short of God’s intent for His Word. That’s why it’s more than Bible reading that we should be promoting/advocating. We should want the kind of interaction with the Word that reveals God, exposes sin, and causes us to worship Him. And for that to happen we need Jesus engagement. So what is Jesus engagement? It’s a relational interaction with the One who is the Word such that His Spirit reveals, renews and revives us, in and through the Word, to love and live for Him in accordance with His Word. Here’s the rub: Bible reading, in and of itself, doesn’t necessarily lead to us loving and living for Jesus. After all, the Pharisees and teachers of the law studied the Bible ardently, but they didn’t love Jesus. Their Bible reading only resulted in legalism and a love for their own traditions. Jesus called them out for this, saying: “These people honour me with their lips, but their hearts are far from me” Mark 7:6 (NIV) and “Thus you nullify the word of God by your tradition …” Mark 7:13 (NIV). That is, their Bible reading perpetuated religious rituals, nothing more. So let’s make Bible engagement about Jesus engagement. Let’s “get beyond propositions and Bible verses to Christ. I do not mean ‘get around’ Bible verses, but ‘through’ Bible verses to Christ, to the person, the living person, to know Him, cherish Him, treasure Him, enjoy Him, trust Him, be at home with Him” John Piper, “God’s Glory Is the Goal of Biblical Counseling,” The Journal of Biblical Counseling, 20/2 (Winter 2002), 8–21. Categories: Relationship | Tags: Bible engagement, Jesus engagement, Theology of Bible engagement | Permalink. In the Bible engagement world there are some fascinating collaborations and the recent one between Bono and Eugene Peterson is certainly worthy of mention. It started many years ago when Bono, the lead singer of U2, started quoting from The Message at some of his performances. Notably, during the Elevation tour before “Where the Streets Have No Name”, Bono would recite these lines from Psalm 116, What can I give back to God for the blessings he’s poured out on me? I’ll lift high the cup of salvation – A toast to God! I’ll pray in the name of God; I’ll complete what I promised God I’d do, And I’ll do it together with his people. Peterson, Professor Emeritus at Regent College in Vancouver, and a Presbyterian church minister for 35 years, retired in 2006. In 2010, during U2’s 360 tour, Bono and Peterson finally got to meet one another. The friendship that transpired has become the focus of a new documentary – a conversation at the Peterson’s home in Montana – about how the Psalms capture their imaginations and fuels their camaraderie. Here’s the YouTube teaser of the documentary (cf. below). It premiers on April 26, 2016. While the teaser gives no clues about the documentary, it’s probably enough for us to simply see Bono and Peterson together. After all, Bono has underscored the passion of the Psalms in his music and Peterson has taught us about praying with the Psalms. Categories: Relationship | Tags: Bono, Eugene Peterson, Psalms, U2 | Permalink. This is a Bible Engagement Blog milestone – it’s the 100th post. The Blog was birthed out of a sense of calling to advocate for Bible engagement. I don’t think it’s a cause I would naturally have chosen. It sort of chose me. Yes, I have a deep love and appreciation for the Word and the One of whom it speaks, Jesus Christ; but what prompted me to start writing was a growing concern about the decline in Bible engagement in the Western world. When I started writing the Bible Engagement Blog in October 2011 I didn’t know what Bible engagement themes I’d be writing on or how the journey would unfold. In fact there have been several times when I thought I’d come to the end of the line – with no creative thoughts about what to write next. But I’ve learnt that those whom God calls, He equips. Time and time again, He’s brought a topic into focus and directed my critique or reflection. That’s not to say that it’s always been easy to write a post. 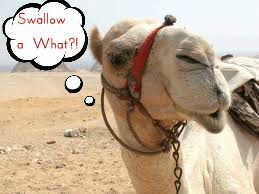 Sometimes it’s felt like I’m straining gnats and swallowing camels (cf. Matthew 23:24)! But through thick and thin, I still seem to be writing. And I’ll keep doing so until it’s time to stop. The content of the posts have ranged across the gamut of Bible engagement related subject matter. Some posts have been more scholarly, some of general interest, and others more technical and research oriented. There have been posts reporting on the work of Bible agencies, the Canadian Bible Forum, and the Forum of Bible Agencies. Articles on the latest statistics from Barna, LifeWay Research, Reveal, Canadian Bible Engagement Study, and a number of researchers have been featured. Biblical passages have been unpacked, definitions considered, Bible reading methods and ways to improve our connections with the Word have been suggested, and a theology of Bible engagement interwoven through the articles. The interplay between the Bible and culture, the church and the individual, has also been discussed. Whenever I write I try to envision who I’m writing to. While I know there are many colleagues, pastors and Christian leaders who read the posts, I’m very much aware of the thousands of Christians around the world who appreciate the articles. All told, I know that I don’t write in a vacuum, and try to say things that resonate with the spirit of sola-scriptura and reflect the views and opinions of other Christians who hold a high view of Scripture. While I’m a serious minded person, I have to say the writing’s been fun! There’s something about writing that’s very pleasurable and satisfying. And it’s enjoyable knowing that when we exercise our gifts and talents, God uses them to advance His kingdom and bring honour and glory to His name. So here’s to the next post, and however more may follow! And here’s hoping that God’s people will be encouraged to live their lives inspired, informed and in-line with God’s Word. For the fame of His name! Categories: Encounter, Interaction, Relationship, Transformation | Tags: Bible engagement blog | Permalink.